Imagine a migratory group of blackbirds, innumerable, that seems to take to the air in one collective breath, or settle, in unison, in a field or on a tree-line. Or a pile of leaves, picked up and thrown into the water, each traveling away on its own current. Think about creeping lines of traffic, a succession of blinking tail-lights stretching up and down a universe of streets and boulevards, moving, stopping at signals, swirling through entrance and exit ramps. What these groups have in common is that, although they are collective, they’re also autonomous – each little “cell” has its own properties, and follows its own rules, so that, to an observing eye, the mass is unpredictable. These systems, presented organically in the physical world, are complex. They defy easy tracking. They don’t respond well to simple linear rules. How do you define their fragmented movements, their myriad initiatives? That’s a question that designers ask themselves as they try to create secure data exchange systems that can think more holistically about network protection. The reality is that the many thousands of hackers and potential threat actors connected to the global Internet are legion – they’re impossible to sweep into one broad database or corral in some isolated part of the Internet – but that doesn’t mean that companies can’t implement a secure data exchange solution. One conceptual way to tackle the problem of collective threats is to build a box, or a set of boxes. Artificial containers help to protect data the same way that a house protects human inhabitants. Just like a house protects its residents from outside threats– SDE excels in building these kinds of digital structures for corporate data, to keep internal data safe while preventing malicious intruders from entering. A central SDE system maintains an orderly collection of data assets in a centralized and trackable environment. Automated security policy enforcement tools for authentication, encryption, scanning and auditing work on data sets as they move. SDE: Secure Data Exchange Broker platform controls the ways that files are shared and uploaded within a company’s digital footprint. This is done for secure data exchange—in order to track these assets and account for them at every stage of a business process. Some of the engineering of these systems, also involves evaluating the potential actions of those little black hats, in the autonomous system outside of the box. 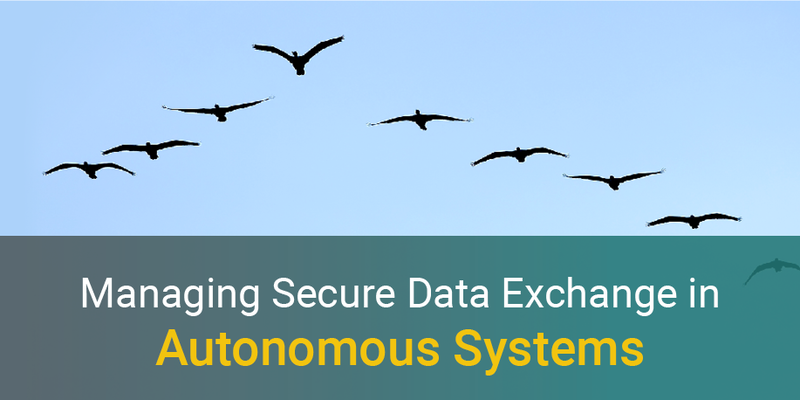 That means, security features must have the ability to stand up to each individual part of the autonomous system. While some engineers may use fuzzy logic to effectively predict behaviors, they may also use machine learning algorithms to evolve. That’s what is meant by the effort to control autonomous systems, or to provide for them in a security setting. It’s not enough to just “set up a fence” – and protect a perimeter. Today’s network security strategists must be curious and analytical, and peer into the chaos to see how they might carve out a safe place for their customers, online and on-premises. Consider what SDE can do for a company that needs a “safe house” against cyberattacks and network threats, no matter where they may come from.